joined Studionext as its CEO. godsend. Studionext will be for Deutchman a bridge between the offline and online worlds. companies looking to hire him onto their teams. Too many online film-oriented companies are looking to be simply destination sites, he said. When approached by Studionext, he researched the company and liked what he found. including and in-between online and film. Except, they won’t be a destination site. the online realm. It arms producers and directors with cost-effective ways to crossover into the digital medium. Studionext aims to open traditional filmmakers eyes to the possibilities and opportunities of online distribution. disease and violence have gotten out of hand. It is apparent that he can name a few things that are wrong with traditional film. When he discusses the digital, online world, he talks with energy and light and creativity. Deutchman talks of possibilities and of building bridges between the two worlds. He said with Studionext he aims to reinvigorate the offline film world, shedding on it some light with ideas borrowed from the digital realm. Another of his goals is to scrutinize the dollars of the business at every level — from development to distribution — in an attempt to make digital filmmaking even more accessible. And Deutchman plans to put that cost-effective mindset to work for Studionext. radical changes at Studionext due to his arrival. The site, which relaunched in June with a new look and a slate of 20 new programs, will continue along the same path its been traveling. Except, of course, it will have at its helm one of the most connected and pioneering producers in the entertainment industry rolodex. disco/dance world and “USA Skate,” a show about skateboard culture. Also at that time, executives there likened Studionext to the Fox Network when it first launched; both companies produce alternative content but attempt to compete in the mainstream. The site will continue its mission to bridge off-and online worlds, exposing traditional filmmakers to digital film and attempting to raise online film to mainstream status. with which FilmFour recently announced a major co-production deal. Station,” “One Day in September“). 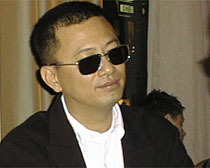 Filmmaker Wong Kar-wai, pictured at Sunday’s “In the Mood for Love” party in New York. Wong Kar-wai to step into the spotlight at the New York Film Festival. the day, Sunday night they celebrated in Manhattan before their first Festival screening at Lincoln Center. introducing the movie to voters and the media. 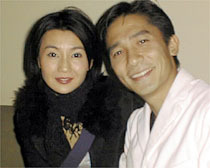 “In the Mood for Love” stars Maggie Cheung and Tony Leung at the Thalia party. 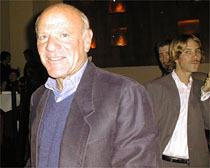 USA Networks Chairman and CEO Barry Diller was among the guests at Sunday’s dinner party. Many of the remaining guests then made their way up to O’Neals on 64th St.
along with the promised desserts. about the beauty of Wong Kar-wai’s latest. Marti‘s “Fin,” Scott Kravitz‘ “Magic Trick,” and Corey Rosen‘s “Keep Clear” are being premiered at Pasadena’s Playhouse 7 theatre. Sciences for consideration for the 73rd Annual Academy Awards. seen by studio and network executives.